NEVER USED. Still in Original BOX. Only opened box to make sure it's all there. All keyboard controllers are not created equal. This is the one with more features, more accessories and more useful software than its competition. 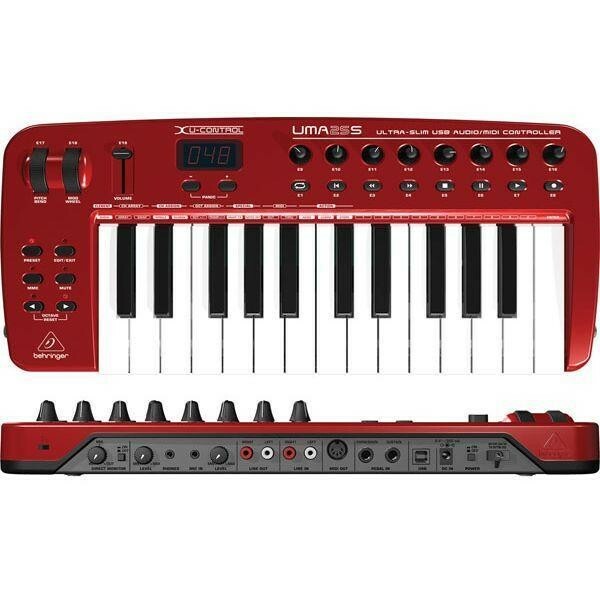 The UMA25S MIDI Controller is an extremely flexible master keyboard with a control section for a wide range of applications from on-stage performance to podcasting. Do you need independent control of computer rack synthesizers? How about control over general MIDI sound modules and effects devices? Maybe you just want to operate sequencing software or computer plug-ins from a convenient remote location? The UMA25S offers total flexibility, tremendous ease of use and allows you to realize your ideas intuitively. Simply put, a MIDI controller gives you the power to take command of any hardware device or software that understands MIDI (Musical Instrument Digital Interface). This means that MIDI-addressable effects processors (such as delays, reverbs, etc.) and audio recording and editing software can be controlled with a single piece of hardware, a MIDI controller. This can be very handy indeed when you have lots of devices spread out all over your studio or workstation space. The MIDI controller sends a control message to the device or program you're using that turns notes on and off, adjusts the volume or changes any one of many addressable parameters. When it comes to remote control, the UMA25S offers more real-time options than the competition. You get 8 knobs, 8 buttons, 2 wheels (Pitch Bend Modulation), 2 pedal ports (Expression Sustain) and 1 fader, for a total of 21 assignable controllers - total control of your operating environment. Once you've assigned the parameters for a particular scenario, simply store it in one of the 16 available preset locations. Remotely controlling transport functions (Play, Fast Forward, Stop, etc., which is also known as MMC, or MIDI Machine Control) on sequencers, hard-disk recorders, drum machines, etc. There are some things that just bear repeating. Besides providing 25 velocity-sensitive keys for the slickest set of glissandos and the snappiest arpeggios, the UMA25S also functions as a full-fledged USB audio interface for recording and podcasting. This powerful interface features a built-in mic preamp with dedicated Gain control, a Phones Output with its own dedicated Volume control and stereo RCA I/O jacks for connecting external devices. The interface is so versatile, it even allows simultaneous recording of the Mic and Line inputs. Because you'll want to take full advantage of the UMA25S' podcasting and recording potential we've included a massive software package including Audacity, Podifier, Juice, Podnova and Golden Ear. You're ready to go live on your PC or Mac computer right out of the box! You also get more than 100 virtual instruments and over 50 effects plug-ins, making the UMA25S a complete mobile studio from input to output. Because it needs to be ready for action in a variety of venues, the UMA25S can draw its operating power from any free USB port on your PC or Mac computer, 3 AA batteries or the optional external power supply. No matter what your performance calls for, the UMA25S is the ideal solution. A guitar-style strap, so you can steal the spotlight from the guitarist and start building your own bevy of fans.